View More In Flatware - Page 9. With a touch of extra shimmer, the kate spade new york Simply Sparkling Silver Dessert Set is sophisticated high fashion for your table. 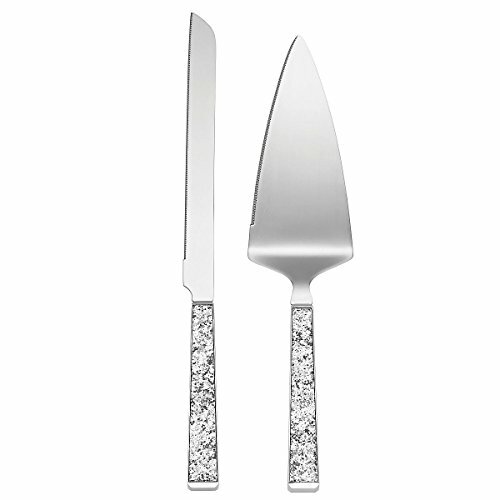 Crafted in beautiful silver plate with textured handles that truly sparkle, this contemporary wedding cake serving set includes a cake knife and server. Perfect for even the most formal dinnerware and special occasion, such as a wedding or anniversary, this elegant pair of cake servers is sure to be the center of attention. Wonderful to give and receive. Crafted of silver plate by Lenox under license by kate spade new york, which has reviewed this dessert serving set for quality and authenticity Hand wash only. Length: 12.5" Packaged in a kate spade new york box.